We are lifting out of the coldest of this cold spell early Wednesday morning. The center of the strong cold high-pressure system from Canada is passing right over New England Wednesday. That means another day of sunshine, and a bit less wind. Temperatures should be a little warmer than Tuesday with a high in the mid-40s. The exception is along the coast with a classic springtime sea breeze keeping the beach areas near 39 degrees. A warm front to the north of New England may bring a few clouds into northern areas late Wednesday and Wednesday night. Otherwise, it should be a little warmer overnight with a low temperature in the 20s north and 30s south. Thursday, we have a good amount of sunshine in central and southern New England, but it will be rather cloudy toward the Canadian border. High temperature in the 50s to near 60 degrees away from the coast. Wind will increase from the south to 20 mph and stronger gusts during the afternoon. That’ll keep the south-facing shorelines colder. A cold front nears our Canadian border Thursday night, with a few showers possible. Low temperature overnight in the 30s and 40s. Friday, we see more clouds than sunshine with a chance of a few showers. If we can get the sun out in southern New England we should be able to get to 60 degrees or better away from the shore. In northern New England high temperatures in the 40s and 50s with a few showers. 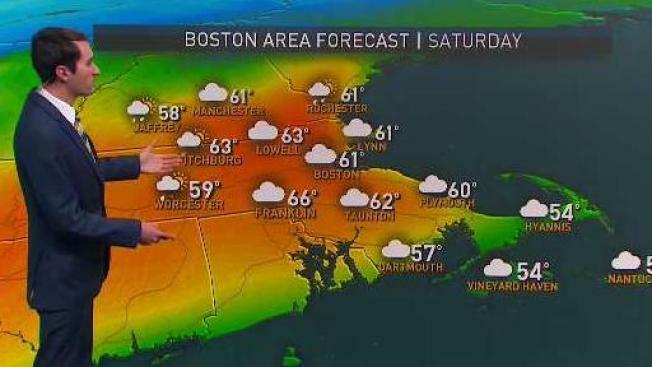 Saturday likely starts off rather cloudy maybe some patchy fog and drizzle. But the wind should come around from the south again and burn off the clouds in the parts of southern New England, pushing the temperature into the 60s. In northern New England, we may stay gray with a chance of showers and temperatures in the 50s and 40s. Low pressure comes over New England on Sunday with a lot of clouds in a period of rain, rain may change to snow in the mountains west and north. Temperatures will fall through the 50s to the 40s as the day goes on, into the 30s in the higher elevations west and north. April Fool's Day looks like it’ll be cooler with a good amount of sunshine. But there will be a storm forming off the southeastern United States coast, and it may linger to our south all week long. It’s too early to say if and when that storm may impact us. We'll keep you posted in our First Alert 10-Day Forecast.